Beanies are the bane of my existence. Okay, that might be a tad harsh BUT you can’t tell me there’s not a learning curve when it comes to crocheting beanies and the sizing of them. There are countless patterns out there. We’re talking different sizes, different stitches, different yarn, different hooks, different fits (slouchy or tight) etc etc etc. We could go on for hours but instead let’s talk about this new basic master beanie pattern that you can use to make just about any kind of hat. How am I going to create a master beanie pattern, you ask? Simply by knowing when to stop increasing and when to stop adding length. We can use this method with single crochet, half double crochet, double crochet or just about any other crochet stitch or pattern. Knowing this allows you to make a beanie based on your own personal tension, hook size, and head size. Cool, right? When you crochet beanies from the top down and you stop increasing, that doesn’t necessarily mean that the hat won’t continue to widen for a few rows. It will take several rows after stopping the increases before it begins to really straighten out on the sides. So, we have a handy dandy chart that tells you when to stop increasing so you don’t end up with a fruit bowl or worse: a lamp shade. If you are making for a child, you will want to stop increasing when the width of the hat reaches about 6.5”. Use the guide above as a general rule of thumb. Check the width of your beanie after every round. When you get the crown of the hat about as wide as suggested, simply stop increasing. If you stop increasing at 6.5″ and have 60 sts in that round, you would continue making 60 st rows until you reach the desired length. In this case about 7.5 – 8″. For this basic beanie, we are going to start with a magic circle, then double crochet 10 times into the circle. With each row we’ll add 10 more stitches so that row 2 has 20 stitches, row 3 has 30 stitches and following that line, row 7 would have 70 stitches. You dig? …etc until width is reached. 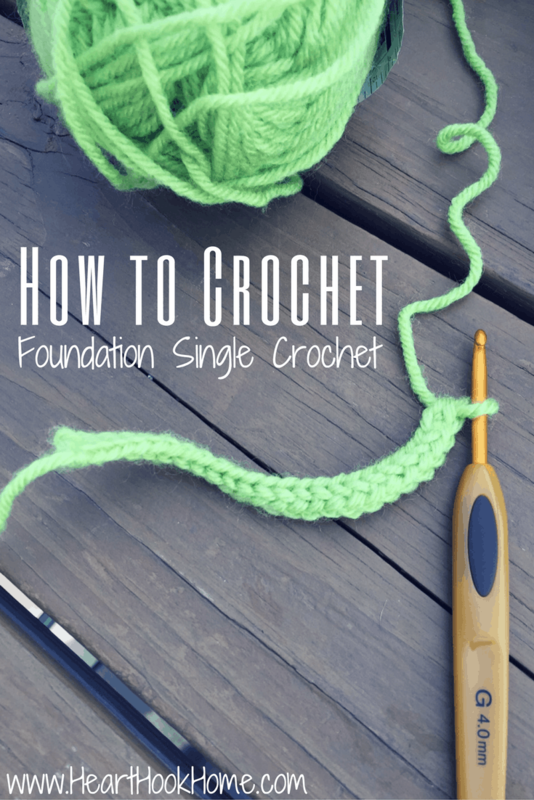 New to reading crochet patterns? You’ll want to read this article before you get started. Remember to check your width after each row, and when desired crown size is reached, simply continue crocheting the same number of stitches in each row until you reach desired length. For example, I know that my head is as wide as 70 sts. Once I finish row 7 I’ll continue each row with 70 stitches until the hat is about 8″ tall. Fasten off and weave in ends. Need more help? There are thousands and thousands of hookers (including myself!) that would be happy to help in the Heart Hook Home Crochet Community group on Facebook. Join us! I crochet hats for charity. I make a lot of hats in HDC stitch. On those, I always crochet in a spiral. I have learned from experience that I need to stop my crown increases at 6" to fit my head which is 23" in diameter. I did the recommended 7" diameter crown for one of the first hats I made and it swallowed my head. Since that time, I just figured that any hat I made (esp. if there was no gauge in the pattern), I would stop increasing at 6" and that has worked for me. I always end up using the pattern size for toddler/kids and it's the right size for my 22.75" head. I know that crochet is very subjective and everyone's gauge varies radically. 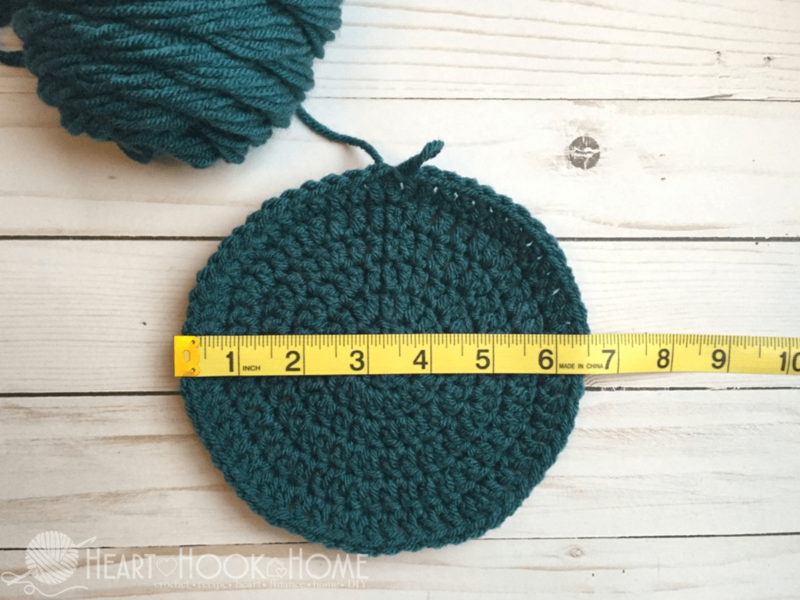 For me, it's really helpful for crochet patterns to have a gauge. Wow! I just found this page and it's so helpful. Thank you for taking the time to post. Well written and easy to understand! I'm a beginner (2 months of expertise under my belt) and am enjoying learning new things. I made my first beanie yesterday but am doubtful the size is right. Will use your method going forward! My ultimate goal is to crochet for charity (beanies, lap blankets, baby blankets with huggie-soft yarn). And I also love the article on savings at Michaels!!! I'm excited to discover this site. I want to to thank you for your time due to this wonderful read!! I definitely loved every little bit of it and I have you book marked to look at new information in your website. Hi Ashley - Thank you so much for these GREAT directions for making a hat. I love the Magic Circle! It looks so nice ! Even though I have been crocheting for years, it’s always good to have a refresher. Your videos are so clear and easy to understand. Thank you Mary! I am so happy you find my tutorials helpful! Perfect! I needed this so bad!! Havent messed one up since i found it! Thank you!!!! Hi Amy! I'm so glad you found this post helpful! Thank you so much for this beanie size explanation! I started one, but realized it would be much too small for me, and I was unsure of how to resize, but this sets me straight. I'm a more experienced knitter than a crocheter, but I'm starting to catch up. Thank you for all you do! Thank you Rebecca! I am so happy that you have found my page helpful! When I do the magic ring it curls under does that mean the stitches to tight? I am a beginner on making hats. Beginner stitchers are known for making tight stitches, so yes, that may be the issue. Try tugging at it and see if it lays flatter. If not, go up one or two hook sizes. I used a size H hook with worsted weight yarn. The crown was never completely flat for me, but I could flatten it enough to measure it. Good luck! When u do the magic circle do u chain 1 then do ur Double Crochets in the circle then join to the 1st double crochet? I’m a newbie trying to learn this hat sizing thing this is absolutely wonderful thank u! What I do is I chain 2 in the circle, and then I make ten dc and don’t count that ch2 as a stitch. When I I come back around the circle, I skip the chain 2 and slip stitch into that first dc I made, then ch2 again and do the same. You’re just using the chain to reach height, and not using it as a stitch itself so you don’t slip stitch into it. This way you’re slip stitching into a stitch, and the chain 2 you skipped helps to close in the gap you get otherwise. There will still be a seam, but it won’t be as noticeable as if you were counting the chain as a stitch and slip stitching into it. This works any time you work in the round like this, and if it’s sc or hdc you would chain 1. This makes SO MUCH sense! When I first learned years ago I used the chain 2 (or 3) as the first stitch. It's amazing how understanding a little thing like that will help. Thank you! Oops I misread your post! Yes, you do that! The only change is you should chain 2 for dc. wish you would make a vidio of how to make a preemie beanie. I am trying to still figure out how to "You repeat what is between asterisks..ok how many times to you repeat what is between asterisks... Need instructions on how to make preemies beanies...not just beanies..and or slouch hats.thank you. You repeat what is in the astricks 10 times. Measure after every row until you meet your desired width (from one side to the other, preemie is 3 or 3.5in). Then you will stop increasing and just do one stitch into each stitch all the way around. You will continue doing that until youve reach your desired height (so 4in from top of the hat to Bottom) Hope that helps!!! This is just the BEST! I'm so glad I found this post!! Do you happen to have any suggestions on how much to shorten it by if you're going to put ear flaps on a hat? Your Perfect Beanie pattern/chart is MAGIC, I have made four hats, each with a different yarn and hook size and each one was perfect. I have been making hats for charity for 20'years, always searching for a pattern that would work for different yarns and hooks but I would never know if they were the right size or not. My standard phrase was "if I make a hat to donate they will find a head to fit," never really knowing for sure. I am so positive that these hats come out to the perfect size that I now feel confident to add a size tag, before it was a guess. Also it gives me a chance to use a lot of my yarn stash of different weights and manufactures. Thank you ever so much, Alisha. I am so glad you have found it to be helpful! Hi Sarah! You could try starting with 8 stitches in your magic circle...and then increasing by 8 for each following row using the same increase pattern until you reach your desired crown width. Hope that helps! Hi, Im definitely busy with a dollie too. I'm using the hook recommended for the yarn. I pulled out everything and started over thinking I made a mistake. Still getting a dollie shape after row 8. Did the 8 stitches in magic circle help? I would really like to finish this suppose to be easy beanie for my dad. Hope there is someone that can help me. Many thanks, Ashlea! I followed your instructions and everything worked out just great. My husband is now the proud owner of a beanie! :-) It looks really good and I feel a sense of achievement. I made it in the Leaping Stripes and Blocks design. Thank you! This arrived for me just in the nick of time (from my Pinterest account). I made a surprise crochet beanie for my husband but it was a disaster. Far too big and sloppy! So I've pulled it back. Now, I will try your method. I've read all the details of your pattern and how to do the measuring and the increasing. This makes perfect sense to me. Can someone help me here? I followed this pattern exactly. However, it seems like after we strighten from the increase, my hat just stops increasing. So the result is like a cylinder, almost. I've tried with different sizes, different stitches and such but to no avail.... What am.I doing wrong? Hi! The same thing happened to me on my first hat! My hook was a bit too small for the yarn and I was crocheting too tight. Try to relaxing your stitches up quite a bit and see if it helps. Good luck! Thanks Catherine! I am using the recommended hook size for the yarn as per the label, but i know i tend to crochet tightly. I'll try relaxing my stitches to see if that improves! What hook should I be using? Hi Deby! I would use whatever the yarn label suggests, then measure as you go. I made one last night in such a short time. It took no time to make and today I gave it to my great granddaughter who is our resident DIVA and 7 years old. She saw it plopped it on her head right away she loved it. Now her mom--my granddaughter wants one in every color. I think I've started something but they are so easy and fun to make that it will be my pleasure to make a gazillion of them. I've made beanies for babies to donate to hospitals. I guess my list has just gotten longer. I really hope that I'll be able to follow the directions . I can do the basic single stitch. I'm excited to try. Hello Ashlea, I have a couple of more questions, as I am new to crocheting regular crochet stitched hats. I can do the "Granny Square" stitch hat no problem! #1. For custom fitting crocheted or (gasp! Knit) hats, how does one "technically/ or specifically" define the "Crown" of the head? #2. How does one measure the "crown of the head", to ensure a proper width/ circumference fit? #3. I've actually used a fabric tape measure, to measure the hat band/ head circumference of my two female roommates, and two men. They all had measurements from 24" - 24.5"!!! So to make an adult size XL, should I add one more increase row (Row 8) to make a total of 80 stitches?? Perhaps you might like to edit your sizing chart, and pattern to accommodate an Adult XL size? - Some people have really big heads!! LOL, especially some guys. Then this pattern would be even "more perfect"!!! I would really appreciate your answers as soon as possible, as I am trying to make some men's hats, and some warmer ladies' hats for charity. Silly me, I found your Facebook group first; I didn't realize that you also have a great website and wonderful patterns! I am so grateful for you in sharing your creative genius, as I am on a really tight budget right now. Thank you & Happy New Year!! Love this, thank you! I gave a new Grandson and finally have got this down to a science with your instructions! I've also used it to treat myself to a new touque! This is PURE GENIUS! Thank you so much for sharing this!!! Thank you so much for this pattern. I have tried to make a simple beanie for my 6 year old grandson, had to frog 2 of them, too small. I hope the 3rd try is the charm. This is freaking brilliant! Thank you so much!! Serioulsy the best beanie tut I've ever seen! I would like to make a beanie using the crochet seed/moss stitch. I am afraid I haven't a clue on how to do the increases for that stitch pattern. This tutorial has been very useful to me regarding how to increase basic stitches and sizing. Thank you so much. Best pattern ever and I love the chart. But my dimensions are off...I stopped increasing at 60 stitches in row 5 and continued 60 stitch rows until 8”, and the width grew to 10”. So what did I do wrong to cause it to grow wider? It’s supposed to do that. If you look at the chart above, she stops increasing at 6.5 inches across, but it ends up being 10 inches across at the bottom for a 18-20 in head circumference. Ok at the length part do I ch2 then DC in each stitch? Thank-you this takes the mystery out of increasing on each round for me. Have quite a few hats to make . Thanks again for all you do. I'm in the middle of several projects now. Have wanted to make a beanie for my granddaughter. Thank you! I'm a beginner and wish you video showed more detail on how to actually do the first row of double crochet. I've only done it before with a chain. Had to look at another site! Also, you don't tell or show how to end the hat once you get your desired length. The chart is very helpful for determining what size! Hey Laurie! I don't count the chain as a stitch. I think it helps to keep the seam less visible. 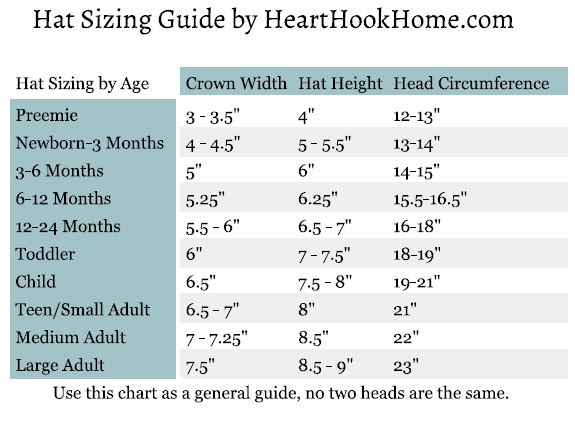 So what am I doing wrong if I stop increasing a toddler hat at 6inches and my hat turns out to be almost 24 inches around? I used a #4 weight with a g hook and did 2 rows of dc and one row of sc. I don’t understand what I am doing wrong? Are you joining into that chain 2 or skipping it and joining into the first regular DC? If you’re joining into the chain 2,you’re adding a stitch each round I believe. What you want to do is skip it and join into the first DC. That little chain 2 that you skipped, is helping to fill in the gap caused by the join, therefore making the seam less noticeable. Hi Andrea, maybe I'm blind, however I didn't see you mention that in your pattern, that's important to know! Hi Paige, you explained that very well, Thank you! I was wondering about that! It's much clearer now to me, Thanks! Hi Ashlea, Sorry I typed the wrong name (Andrea)! I don't see a way to edit my comment. Thank you so much sharing your pattern! I really appreciate it. Laurie, that's a great question, I was wondering the same thing. Most people do count it as the first DC, I was too. Thanks for answering Laurie's question, Ashlea and Paige, it helps me to understand the instructions a lot better. You’re very welcome Jane. This idea was so confusing to me as well when I first heard of it, and I was fortunate to have a friend help. I wanted to explain further, the way I have been doing it and using this pattern above. When making the original 10 DC into the magic ring, don’t chain. Just slip stitch to join into the ring, and then make 10DC. Second row, we’re to put 2DC into each of those ten DCs. So, join to that first DC, and make a chain 2over it. Then into that very same DC stitch, make your increase (2 DC). Then go around each of the remaining 9. Then to join, just skip that chain 2 as if it’s just attached to the dc next to it (or pretend it’s not there). Join into that first DC and make another chain 2. This row calls for only 1 DC into the first stitch, and 2 in the second, all the way around. That first DC goes into the same first dc you joined into. Same stitch. I hope that makes sense! I love it because I always struggle when I join, trying to join into the chain. It’s great skipping it as it’s easier to join into a real stitch. Actually if you do want to chain into the magic ring, you certainly can, but it’s not a stitch, so you need to make 10 actual DCs a season well. Then when you come around, skip the chain and join to the first DC. I just don’t bother with it in that first row as I’m not really sure what the real” rules are! Does the pattern work the same for all yarn weights? Truly when someone doesn't understand then its up to other users that they will assist, so here it takes place. Hi, Really wanted measurements for different ages so l could make different pattern beanies, I'm a beginner but seem to be doing ok l dont know if that is because I've knitted most of my life. Now 62 empty nester and ready to take on the challenge. I'm really disappointed there's not more video tutorial for tops as I'd really love to make myself something in all the years of knitting l never managed to make myself anything. l dont want a double or treble top I'd like a little bit pattern in this. Any Suggestions? I've started this pattern three different times, and each time I get to the point of increasing leangth and not width, it just keeps becoming a bigger circle, as if it's a pot holder and not a hat. What am I doing wrong? Hi Katie! I think you might be stopping the increasing too late. What size are you making, and what are the measurements when you stop increasing? Are you remembering the slip stitch? That ended up being my problem! I love this! Thanks for breaking down the basic beanie principles. Who has time to crochet swatches to figure out if your yarn and crochet style will match the pattern size. Very cute hat! I have one question though. Are you counting the chain as a stitch? Usually a pattern say to count the first chain 2 or 3 as the first double crochet in the row. This pattern doesn't seem to work out that way for me. Thanks! And happy hooking! Hi Ashlea again, Was wondering if you may be aware of the ECA program. I am ECA - E-Commerce Associate at TripleClicks.com and have started my own Global Online Store. Below is the link, it maybe of interest to you. Thanks for all the tips above. Hats are my fave to make. I find that most every pattern seem to be worked a few times to get the right size bc we all have different tendions, which can cause problems with dozing. The chart is really going to help me ! Every time I add another row, it increases the crown width by 1inch. (So row 3 is 3.5in, row 4 is 4.5in, row 5 is 5.5 in, etc). How do I make a toddler size with only 6in in crown width? If I add another row the crown width will go from 5.5in to 6.5in. Thank you for sharing. This info is very helpfull! This is so helpful. I have to wear a hat after a rather botched scalp biopsy and like to make a basic beanie , add on several inches and fold back , then pin a stunning brooch on the top of the folded back band. Sizing has always been so problematical but now I have all I need to know for a perfect result. Thank you so much. My hats always come out stiff.. Are my stitches too tight? Could be! Have you tried going up a hook size and seeing if that helps? Hi Ronnie, Are you starting to decrease when you get to 70 sts? It should start tapering down after a few rows. If not, let me know. I just love how clear and fun your instructions are. I have read A LOT of crocheting blogs and I found yours by going down the rabbit hole if clicking an associated link. So glad I did. I am inspired and tickled by your experience and enthusiasm. Looking forward to more postings and emails. Thanks for sharing....I'm always hoping to reach desired size. Hi Reba! I usually use an H but as long as you check your measurements it shouldn't matter. Great advice...I am looking to knit a Toddler size messy/bun hat with #5 yarn. Could I use this same technique? Instead of magic circle, I would chain 10 and do 10 hdc in the ring to make the hole for the bun or ponytail, then continue to increase following the instructions for the right age. What do you think? I recently made some ponytail hsts and that is how I did it. Come out great! Hook size will determine the size of the stitch. A smaller hook will mean more rows to reach desired measurements while a larger hook will take fewer rows. A smaller hook will give a tighter look while a larger hook will give a more open look. Hope this helps. 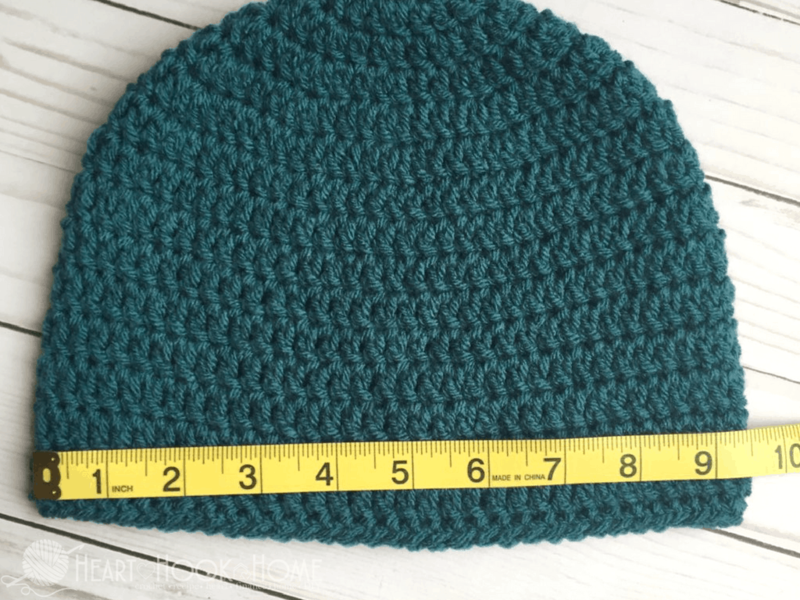 It is not based on the hook size but the measurement of the hat. so as long as your product reaches the measurements of the chart you will achieve the right fit of the hat. How do I know what size hook to use for a child, 6.5? This is just for what I have been looking. It will be invaluable and eliminate poorly fitting beanies. Thank you! What size hook should I be using? I have crocheted and ripped out so many times trying to get size right! Thank you sooooo much! 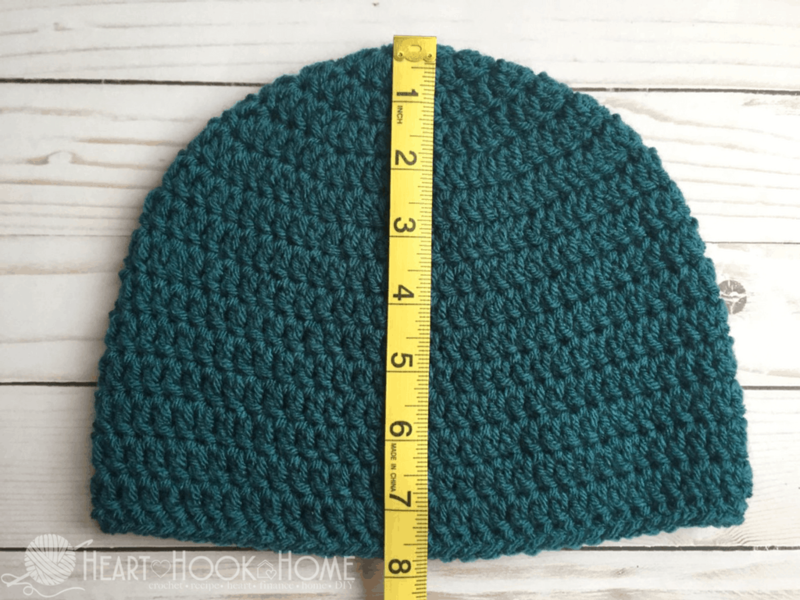 This is a really great tutorial and one I will refer to when I try to make hats again - they usually turn out lopsided and either too big or too small. To this day I still don't have a crochet hat that I can proudly wear outside the house :P Thanks for sharing! Thank you so much for all your help in crochet stitches etc. you have made it so easy for me to do more projects that I couldn't do before and love making new things for my family and friends! Thank you for sharing. You are always so helpful and accommodating. Thanks soooo much! This will be tremendously helpful. You are welcome Judith! I'm glad it helps. I get 30 sts on row 3, but end up with 44 sts on row 4, if I repeat all the way around. Are we supposed to stop increasing at a certain point to get a total of 40? And 50, etc? Have been crocheting for 50 years, so I'm not new at reading patterns, but following this pattern simply does not come out as stated. What am I doing wrong? Will appreciate advice! I'm so sorry! Just realized what mistake I was making! Thank you for posting the size/measurement chart. It will be most helpful as I crochet hats for chemo patients and the homeless.